The World Harvest Church (WHC) in Columbus, OH is one of the top 10 Christian broadcasters in the nation. Beaming to about 877,000 households, the church felt the imperative to answer to the federal government’s mandate for the switch digital broadcast by February 2009. At the same time the engineers are answering to a higher authority and decided to go high-definition while they were at it in order to expand the scope and format of the program. Rod Parsley, the pastor, wanted the HD television studio to incorporate a live studio audience for his show, Breakthrough with Rod Parsley, with forward-thinking control spaces to lend support to that effort. The integrator was ROSCOR, out of Chicago. They had done several projects for World Harvest in the past, notably their eight Avid edit systems. 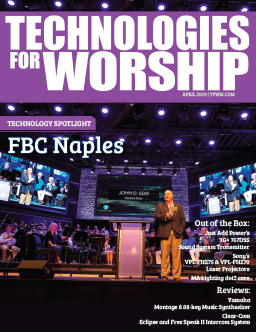 “The video portion of the project involved design of a new technical operations center coordinating all signal flow within the new HD production center, and to the 5,200-seat sanctuary approximately 750 feet away,” said Mark Beall, senior editor on Breakthrough. Placed on a set in-the-round with a slew of flat panel displays to visually complement the pastor’s points, the new format of the program is a combination of a talk show, news magazine, and teaching session with a live audience and live band coming in and out of segments. The church also produces programming on location to document its humanitarian efforts in disaster areas. Even though Sindorf has plenty of work back at home as executive producer, he also could find himself at various locales around the world where help from the World Harvest is needed. In September, he was in Texas in the middle of hurricane Ike devastation in Galveston. “I was there to produce a TV special on the church’s relief efforts,” said Sindorf, “but you get involved in the work relief at the same time.” On location, two Sony XDCAM HD cameras were chosen for acquisition. They provide a variety of different compression choices and the longer recording times. Back home at World Harvest, the technical operations center includes DVCPRO HD100, DVCPRO25, Digibeta and BetaSP for cross-format duplication and up-conversion of legacy material. There are two video control rooms, both using Avitech multi-viewer processors. The main production control room is a bi-level traditional workspace with a Grass Valley Kayak High Definition production switcher as the centerpiece. “The design of the Kayak allows us to utilize two different switcher control surfaces from the same frame,” said Beall. 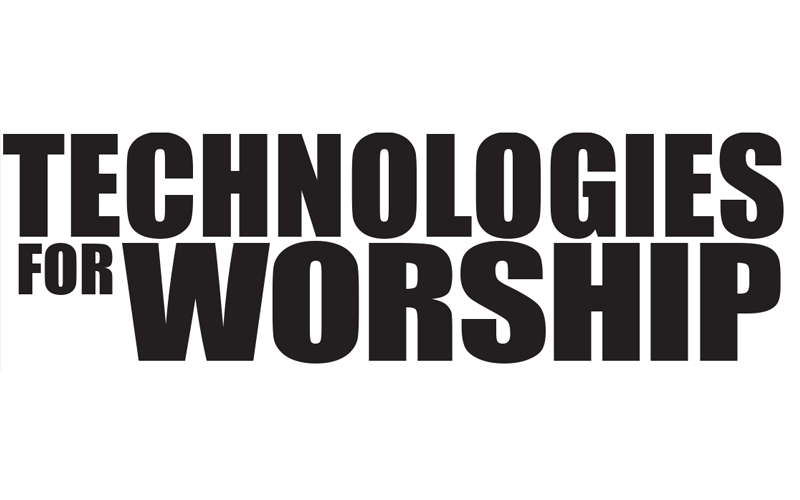 “In our design ‘Presentation Control’ takes one M/E bank, and switches either the IMAG display for the sanctuary during a worship service, or the matrix of 22 plasma displays during a studio production. The main control room uses the other two M/E banks, or can take control of the presentation control feed if needed. Three Grass Valley Turbo DDRs allow for instant playback of clips and packages to support the worship service or daily program. “We feed fiber from the tech operations center back to the sanctuary,” said Beall. “Feeds are then split off from there to feed the flat panel displays that are in the sanctuary itself. One of the big challenges integrating this HD studio was on the audio side of things due to the large number of audio signals. “What we’re using the fiber for between the two facilities is mainly for audio,” said Beall. “There are 48 channels in the sanctuary and all that is transmitted back to the technical operations center by fiber. 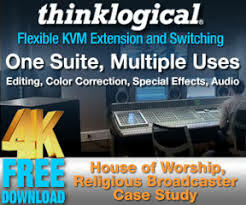 In the studio itself, we have enough for 96 channels of audio because the studio programs also involve a live band and an audience.” The audio is multitracked both in the new facility in Pro Tools and there’s also a back up or tape-based multitrack located in the sanctuary just as a fail-safe. In a unique design, the church is using a dual Pro Tools set up. “We put in a Digidesign Pro Tools live console and then used a second existing pro tools console to operate two different consoles at the same time,” said Beall. Broadcasting is more complex in the digital format because it is handling both high-def and standard-def signals. “Our broadcast partners and networks are not quite ready for HD,” said Beall. “It gives us some time to work through these problems before they are ready for HD. That’s a good thing.” World Harvest is shooting everything in HD and editing natively in HD. At the final process, they are converting down to standard definition and using a 16:9 letterbox so none of the picture is cropped off. Since part of the show’s format is for Pastor Parsley to get up and walk around, the studio and its lighting is designed to be flexible. Tungsten lights are combined with the LEDs and spotlights are used to fill areas that are not covered.